UNDATED - For the week ending Sunday, producers continued cutting silage and seeding winter wheat under warm, dry weather, according to the USDA's National Agricultural Statistics Service. Temperatures were well above average for mid-September as afternoon highs warmed to the 80s and 90s in many locations early in the week. Cooler temperatures returned by week's end along with showers and thunderstorms across western and east central South Dakota. There were 5.7 days suitable for fieldwork. Topsoil moisture supplies rated 22 percent very short, 26 short, 51 adequate, and 1 surplus. Subsoil moisture supplies rated 29 percent very short, 34 short, 37 adequate, and 0 surplus. Corn condition rated 12 percent very poor, 16 poor, 32 fair, 36 good, and 4 excellent. Corn dented was 77 percent, behind 88 last year and 89 for the five-year average. Corn mature was 14 percent, well behind 38 both last year and average. Soybean condition rated 6 percent very poor, 13 poor, 35 fair, 40 good, and 6 excellent. Soybeans dropping leaves was 49 percent, behind 64 last year and 63 average. 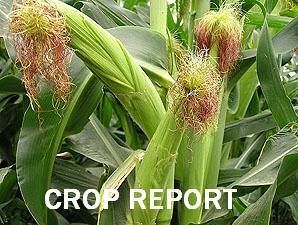 Sorghum condition rated 9 percent very poor, 20 poor, 54 fair, 17 good, and 0 excellent. Sorghum coloring was 73 percent, behind 91 last year and 90 average. Mature was 17 percent, well behind 44 last year, and behind 31 average. Sunflower condition rated 8 percent very poor, 21 poor, 45 fair, 24 good, and 2 excellent. Sunflowers ray flowers dried was 71 percent, ahead of 60 last year, but behind 77 average. Bracts turning yellow was 35 percent, ahead of 27 last year, but behind 47 average. Bracts turning brown was 10 percent. Alfalfa condition rated 31 percent very poor, 32 poor, 20 fair, 16 good, and 1 excellent. Alfalfa second cutting was 88 percent complete, behind 94 last year. Third cutting was 61 percent, behind 68 last year and 76 average. Barley harvested was 96 percent. Winter wheat planted was 30 percent, ahead of 18 last year and 24 average. Emerged was 1 percent, equal to both last year and average. Pasture and range condition rated 31 percent very poor, 27 poor, 27 fair, 15 good, and 0 excellent. Stock water supplies rated 23 percent very short, 33 short, 43 adequate, and 1 surplus.